... or lay prostate before their televisions just trying to comprehend the unbelievable achievement they believe regardless. It's prostrate. Prostate is the gland. And I don't think you lay prostrate when watching TV, anyway. Yes, let's see some photos, shall we? Does anyone know why the comet (67P) which Philae is heading towards, doesn't seem to be there? Rosetta’s OSIRIS narrow-angle camera witnessed Philae’s descent to the surface of Comet 67P/Churyumov-Gerasimenko yesterday. This animated gif comprises images captured between 10:24 and 14:24 GMT (onboard spacecraft time). More images showing Philae closer to the surface are still to be downloaded. Separation occurred onboard the spacecraft at 08:35 GMT (09:35 CET), with the confirmation signal arriving on Earth at 09:03 GMT (10:03 CET). The signal confirming landing arrived on Earth at 16:03 GMT (17:03 CET). The lander separated from the orbiter at 09:03 GMT/10:03 CET and is expected to touch down on Comet 67P/Churyumov–Gerasimenko seven hours later. Confirmation of a successful touchdown is expected in a one-hour window centred on 16:02 GMT / 17:02 CET. Rosetta and Philae had been riding through space together for more than 10 years. While Philae is set to become the first probe to land on a comet, Rosetta is the first to rendezvous with a comet and follow it around the Sun. The information collected by Philae at one location on the surface will complement that collected by the Rosetta orbiter for the entire comet. Who says the camera should be pointing in a direction to capture the probe and the comet at the same time? In my experience, when you are heading towards something, that something is in front of you. As the probe was (I assume), between the comet and Rosetta, I would expect to see it. So you are assuming, as in you do not rightly know. Got it. No, I don't know. We are told that Rosetta is photographing Philae as Philae descends to the surface of the comet. But I don't see a comet. Are you both suggesting that the comet is on the other side of Rosetta? The opposite side to where Philae is descending to??? So Legion, what is your theory about that photo anyway? That the conspiracy cobbled together a gif and posted it on the internet without noticing that they forgot to include the comet? I have no theory about these photos. I just find it very odd that the comet is not visible. Do you not? 1. 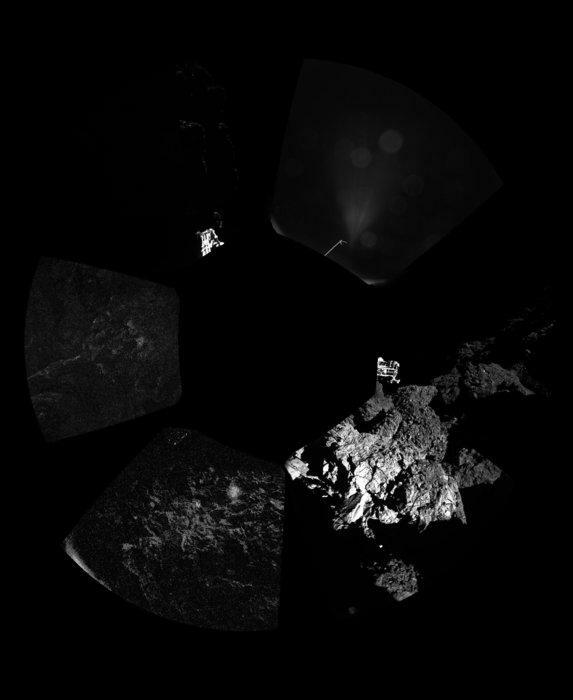 The Rosetta camera was not directly in the comet-philae line and so the comet was not visible. 2. There is some exposure issue with the camera that I am ignorant to. 3. The angular diameter of the comet at that range was too small for the camera to detect. 4. The conspiracyTM put together a gif of the philae's landing, posted it to the internet and then realized they had forgotten to put the comet in. There might be more options that I have not thought of at this time. No, because I don't know anything about the conditions the photo were taken under. The comet is hiding behind that little probe. It's perspective, plus the sun isn't out so the black rock can't be seen to our weak eyes. Obviously though, the reason why the probe is lit up, is because Rosetta had a 10 billion candle power torch shining directly onto it. And to think that we get called the nutters. Cheers Scepti. I feel a bit embarrassed now! Of course the comet was too small to detect. Thanks again. Your sarcastic tone does not match up with someone who has no theory about these photos. Can't you be honest? As you can see Rosetta was not in a synchronous flight path with the comet, so there is a plausible reason why the comet is not in the photo. Are you joking? That bad powerpoint slide is proof of something??? Edit: Rama, have you contracted brain maggots? Plausible reason is not the same as proof. Get your head in the game kid. A powerpoint slide is "plausible reason"? LOL! No, you are having troubles I can see, let me help you. A non-synchronous flight path on the part of the Rosetta is the reason I said is plausible. Rama, you have grown on me somewhat over the months. I had hoped that you were interested in proving things one way or another. And then you go and post that thing. I can't help but feel disappointment. Legion, you disappoint me, with your sad attempts at baiting; is that all you can do? I am not trying to prove anything in this case except that there are plausible alternatives that don't require idiotic hoaxes. As I have already said, there is too little context with the photo you posted to definitively say anything. Do you believe that an asynchronous orbit could explain why we see the probe and not the comet? Now, when are you going to admit that you have already developed a theory, or at least partial theory, about the lack of comet in the photo? I can fully understand why Scepti posts in the way he does. I asked a reasonable question: why is the comet not visible in the photos? Rama decides to provide a plausible reason for why the comet is not visible by posting a powerpoint slide! When I point out the absurdity of anyone accepting that as proof or even a plausible reason, he starts ranting about "idiotic hoaxes". Thanks for showing your true position, Rama. I can fully understand why Scepti posts in the way he does. I asked a reasonable question: why is the comet not visible in the photos? Because the comet isn't within the field of view of the photo. That's why. Rama decides to provide a plausible reason for why the comet is not visible by posting a powerpoint slide! When I point out the absurdity of anyone accepting that as proof or even a plausible reason, he starts ranting about "idiotic hoaxes". He never claimed it was proof. He was trying to show, in a general sense, that the three bodies weren't in a straight line. Why would they be? Orbits are never straight lines, and, yes, these are orbits. Orbital mechanics don't behave the way you seem to be demanding. Because it's on a PowerPoint slide means it has to be implausible? Why? Did you just imply that because there are sometimes eclipses, the lander should always be in front of the comet to "eclipse" it"? "Orbits are never in straight lines". Get it now? I do get that you think the orbit of the moon is a straight line. It is not.